Sitting on a park bench truly signifies a shared pubic space. 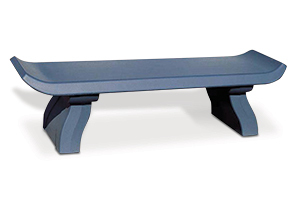 Decorate gardens, streetscapes and parks with the smooth pagoda styling of this precast backless bench. The gracefully winged, curved bench ends with arched legs create a distinct, alluring statement. Constructed with reinforced concrete, this bench will withstand the rigorous conditions caused by constant outdoor exposure. Sit back, relax and take in the scenery.